Cider brand Magners has handed PrettyGreen the task of attracting a new generation as it responds to a drop in sales of almost £10m and growing competition in the 'over-ice' market it pioneered. The agency will deliver all PR, digital and events activity during 2013, which will bring a major overhaul of the C&C Group-owned brand. PrettyGreen will work alongside the brand's creative and media agencies Red Brick Road and Havas, having assumed digital duties from the former and trade duties from Clarion. Magners did not previously have a consumer PR agency. PrettyGreen founder Mark Stringer will lead the account, reporting to Magners marketing manager Richard Schmidt. Schmidt said the work aims to 'introduce a new generation to the magic of the Magners moment'. PrettyGreen is tasked with running a year-long consumer and trade PR campaign, while managing Magners' UK social media channels and handling on-trade sampling activity across the UK. It will not be working on the brand in Ireland, where it is known as Bulmers. Magners Original is the third-largest cider brand on the market, with value sales of £55.5m in the year to October 2012, according to Nielsen. However, sales declined by nearly £10m during the preceding 12-month period and it has been leapfrogged by Stella Artois Cidre, which launched in 2011 and is now second to market leader Strongbow. Competition is intensifying, with the launch of Carlsberg's £10m ad campaign for its new cider Somersby last month. 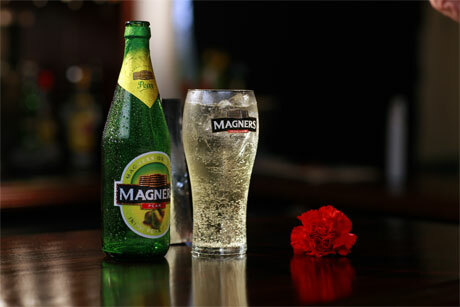 Magners plans to run a new campaign with sociability at its heart.